What is fiber-optics and why it is it choice of most communications companies. You may not know much about fiber-optics, but you should know that the technology is about fifty years old. The first laser powered fiber optic was developed in 1963. The first patent was granted in 1965. The first practical fiber optic cable was developed in 1970 by Owens-Corning glass. Finally, the first long lasting fiber optic cable (in its current configuration) was developed by Schott Glass in 1973. An optical fiber is a purposely designed strand of glass or plastic used to transmit light from one of its ends to the other. As such it acts as an optical waveguide. The field of fiber-optics is one in the applied sciences and engineering areas. These areas are concerned with the use and design of optical fibers for a wide range of uses including lighting, digital data transmission, and video transmission. This article will concern itself with the application of fiber-optics as a digital communications medium. In fact most optical fiber used in the world is devoted to digital communications. As a method of transmitting digital data, fiber-optics have distinct advantages over transmitting information over wire. Light is not subject to electromagnetic interference, for this reason it can be transmitted farther than an electrical signal before the signal suffers from degradation. Degradation in the communications industry is called attenuation1. Though there are still distance limits, the limits for light over fiber are considerably farther than an equivalent electrical signal sent over wire. Optical fiber is not subject to corrosion though it can be damaged by water at freezing temperatures. Fiber optic cable is considerably lighter in weight making planting2 it much easier. In fact aerial fiber-optic cables are often attached to existing wire run overhead without any additional support structures. This precludes digging trenches or running new wire overhead. Not only does this save time, but it reduces the headaches associated with disturbing neighbors, procuring permits, and the expensive trenching or wire handling equipment required. Though the glass fiber in the optical cable is considerably more fragile than wire, the industry has found some cheap and effective ways to make fiber cable more rugged. One way is in the improved buffer (jacket) around the fiber. Another is in the makeup of the part of the cable devoted to strength. Fiberglass cord and Aramid (Kevlar) fiber are often added to the cabling for strength. This is particularly true of cable designed for outside use. Fiber still has its share of problems. None of them are worse and most are significantly better than other communications media. Just as with wire, the fiber-optic signal does degrade with distance. However, it degrades significantly less and over greater distances than any other media including satellite communications. Plant means the cable is laid somewhere. Because the cable has to have a physical presence in space (along telephone wires, in the ground, in a cable trays, etc.) it is still subject to damage. An unintentional dig will sever the fiber and destroy it. Someone "fiddling" with existing cable can also damage or disconnect it. A physical cable plant is also subject to environmental conditions such as freezing weather and rodents. In fact one of the biggest problems in an outside plant (cable laid outside of a building) is rats, mice, and moles chewing through the jacket and buffer exposing the fiber-optic to outside conditions. For some strange reason vermin and even rabbits seem to like the taste of the plastic, though they don't eat the glass fiber itself. Most fiber optic cable is a glass core surrounded by another, dissimilar glass cladding, which is then surrounded by a plastic buffer (jacket). The parts of the fiber cable and the fiber itself have specific terms. See the image below. Core: The core (glass) carries the light signal and can be anywhere from 8 to 62.5 microns (millionth of a meter) in diameter. Cladding: The cladding (glass or plastic) acts as a mirror surface to the core and confines the light beam to that core. The cladding is typically pure glass or optical grade plastic. It's only purpose is to confine the light beam to the core. Primary Buffer: This is a flexible plastic coating designed to protect the glass core and cladding. The buffer has a similar function to the insulating plastic coating around wire in that it is there to protect the glass fiber. The primary buffer is typically two hundred (200μm) microns thick. Outer Buffer: This is also a plastic coating designed to provide additional protection to the fiber core and cladding. It is also larger in diameter to provide fiber-optic professionals with a material large enough to work with comfortably. The outer buffer is typically seven hundred (700μm) microns thick. The core, being anywhere from eight (8μm4) to sixty-two point five (62.6μm) micrometers in diameter is almost i invisible to normal vision. The cladding, which adds another one hundred twenty-five (125μm) micrometers to the fiber only improves this visibility slightly. The primary buffer gives the fiber protection from rough handling and provides fiber-optic workers with a color-coded means of distinguishing one fiber from another. The outer buffer provides fiber-optic technicians with an additional color coded identifier and is large enough for most people to work with comfortably. Fiber optic has many advantages over wire. Though those advantages have been discussed above, this section will cover them in more detail. Telephone companies (TelCos) were the first to use wire extensively in communications. It should come as no surprise then that TelCos were also the first companies to use fiber optics. This was no mistake. TelCos discovered and documented the advantages and disadvantages of wire beginning almost a century ago up through today. The advantages of fiber-optic over wire were readily apparent, but the expense to produce and service fiber-optic was initially quite high. It was, after all, a new technology when first demonstrated in the 1970s. Signals sent over wires bundled together tends to interfere with each other. The signal sent over one wire, will add to or detract from the signal sent over a nearby wire. Because wire is typically bundled in collections of twelve (12) or more wires, signal interference was a given. To lessen this problem wire companies, with the help of physicists and other materials scientists, began combining pairs of wires by twisting them together. Typically this is a ground wire twisted together with a signal wire. This lessens the interference between the signal wire and another nearby, but does not completely do away with the problem. The longer the run of wire the bigger the problem of signal "cross-talk" between the wires. Because the light signal sent down a fiber-optic cable cannot escape the core it also cannot interfere with a light signal sent down an adjoining cable. This means signal boosting is not required as often (over distance) which also means less amplifying equipment is needed as compared to wire. Initially fiber-optic cable was expensive to manufacture, but like anything else, the cost to produce the cable has dropped significantly over time. Because fiber-optic has less signal attenuation than wire less amplifying equipment is required for the same distances as wire; this also reduces costs. For example a wired signal pair for Internet access can only run from one hundred to three hundred meters before an amplifier needs to be added to boost the signal. Fiber-optic can run for tens of kilometers with no signal boosting required. Because fiber-optic cable is lighter it requires less equipment to haul it around and install it. This reduces the costs to maintain that equipment and the fuel to move it around. Fiber optic cable has a relatively good strength to weight ratio. This makes it easier and less costly to install than an equivalent run of copper wire. Where an overhead wire run (on telephone poles) will require support members and strain relief, fiber-optic cable is light enough to be supported by the existing copper wire already in place; the fiber-optic cable is simply lashed to existing copper wire run overhead. Bandwidth is a term that refers to how much information can be transmitted down a particular medium. In this case the medium is copper wire or glass fiber. One of the key advantages of fiber-optic is that it can carry multiple signals at the same time. Copper wire can do this too, but in a much narrower set of ranges and much shorter distances. Fiber optics use considerably less power than the equivalent run of wire. This means amplifiers for fiber-optic use a fraction of the power required for copper wire. This, in turn, means fiber-optic amplifiers are less expensive to purchase, are smaller, use less power and are used less often due to the efficiency of the signal sent down the fiber. For example the power required to drive an LED or laser for signal generation in fiber-optic is measured in the micro Watt range where telephony signals are measured in the milliWatt or higher range. Because fiber-optic cable is so much narrower than wire the "real-estate" required to run the fiber-optic cable is considerably less than for wire. For example a wire telephony cable designed to carry one hundred twenty-eight signals may be up to three inches in diameter; a fiber-optic cable capable of carrying the same number of signals can be an eighth of an inch (or less) in diameter. The size of the core in fiber-optic cable and the makeup of that core determine the type of signal sent down that fiber and the type of fiber-optic cable used. This type of fiber-optic cable is the smallest in diameter. It is used for the longest distances as the signal sent down the fiber degrades the least over distance when compared to other fiber diameters. This particular diameter of fiber-optic is referred to as Single-Mode fiber where mode is the wavelength of the light. In other words, this cable is designed for a single wavelength or mode3. Of course this means only one signal is sent down this fiber at a time and single-mode fiber is often provided in pairs; one fiber for sending and the other for receiving. Because the signal sent is a beam of light it is quite fast. As you may recall the speed of light is roughly 186,200 miles per second or 299,792 kilometers per second. 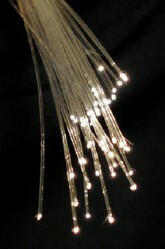 Single-mode fiber is typically "driven" by lasers and is used primarily for voice communications. These fiber cables are referred to as Multi-Mode fibers and they are capable of carrying multiple wavelengths (or modes) of light at the same time. Though there is plenty of 62.5μm core fiber out there it has been replaced by the 50μm core as that smaller diameter is more efficient. Multi-Mode fiber runs shorter distances than Single-Mode fiber, but the distances are substantial at up to thirteen kilometers or eight miles before amplification is required. Multi-mode fiber is used for the "triple play" where a provider might want to provide voice, television and data simultaneously over the same cable. Multi-Mode fiber is typically confined to a distance of thirteen (13km) kilometers, eight (8mi) miles or less. Multi-mode fiber is typically driven by Light Emitting Diodes (LEDs) or Vertical-Cavity Surface-Emitting Lasers (VCSEL). Both these signal producers are cheap to manufacture. This fiber type does not have wide usage and is typically only found in cars and audio equipment. The core of POF is typically one hundred (100μm) in diameter or larger. Signal attenuation in POF is severe and distances are typically quite short. I hope this provides the reader with a better understanding of fiber-optics and their increasing use in telecommunications. There will be more on this subject. How the cable is made including elemental metals added to the glass core, how the different types of fiber work and where they are used and finally what devices are used to power the light signal down through the cable. 1 Attenuation: The gradual diminishing in the strength of something; in this case a signal. 2 Plant: This is the word used when referring to installing fiber-optic cable in a fixed location. Outside plant means outside of a building. Inside plant refers to cable laid inside a building. 3 Mode: In the context of this article a mode is the wavelength of a ray of light. 4 Micron: This is really an archaic term and not generally accepted by the scientific community at large. A micron is one millionth of a meter (a meter is thee feet two point four inches). For comparison a human hair ranges from 17μm ~ 50μm (blond hair) to 56–181 µm (black hair). To say that the fiber core is the width of a human hair is no exaggeration. I'm glad you enjoyed it Angel. We've explored what the cable is and how it is made. This essay covers how the cable is actually used.